An expansion of the company's Doheny offset line, the guitar features G&L’s PTB system for bass roll-off, a push/pull coil-tap for single coil-like tones and—for the HH configuration—a G&L AS4255C in the neck and an AW4368C in the bridge. The guitar also features a Leo Fender-designed Dual-Fulcrum vibrato and a vintage, gloss-finished maple neck. 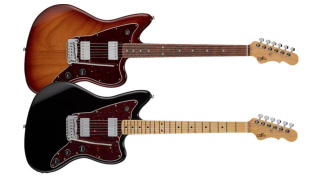 It will be available in two configurations: Jet Black on an alder body with a maple fingerboard and Old School Tobacco Sunburst on an okoume body with a rosewood fingerboard.